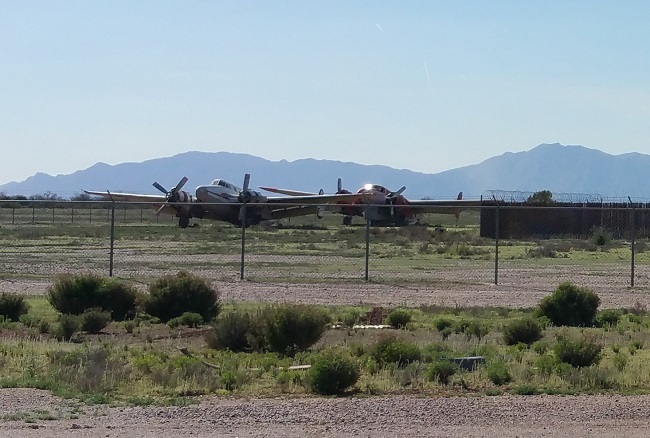 It's been a long time since an airplane has flown in or out of Gila River Memorial Airport. Built to support the Pacific front in World War II, it now serves as an airplane graveyard. After checking out the ruins of Mesa, Arizona's agricultural heritage, I made my way south. It was a perfect sunny day, and I could hardly wait for my first exploration of an abandoned airport. 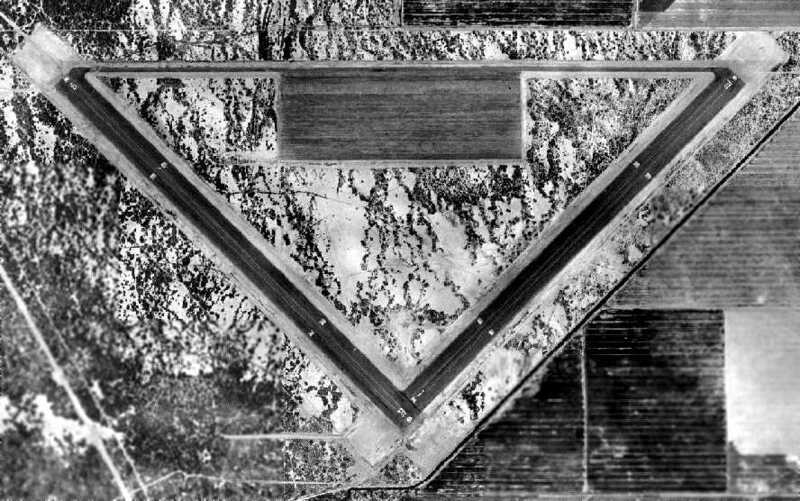 Gila River Memorial Airport was built in 1942 to support the rapidly growing U.S. aerial operations during World War II. 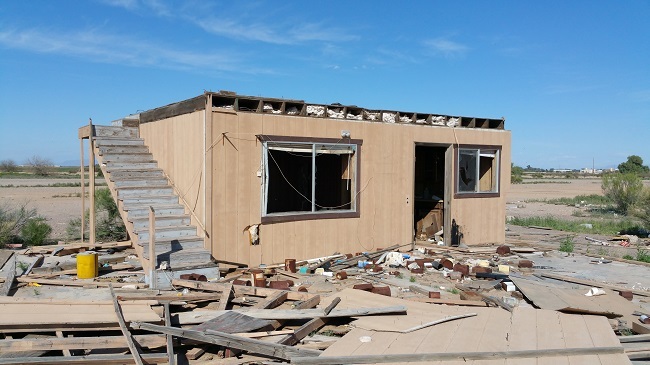 The 1,345 acre stretch of land was designated Williams Auxiliary Army Airfield #5. 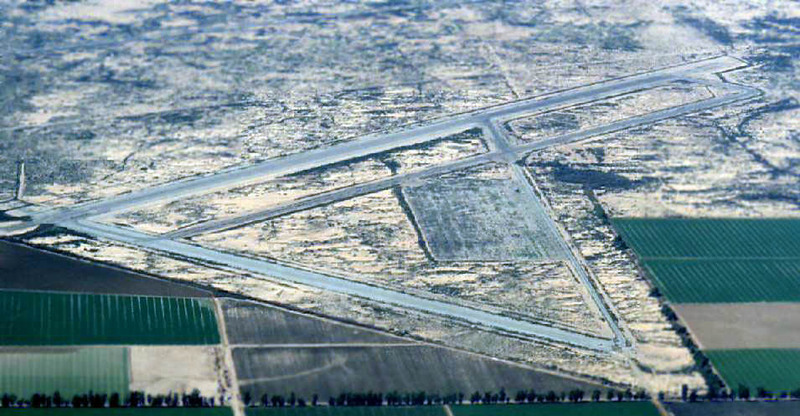 After the war, it was renamed Goodyear Air Force Auxiliary Airfield and the runway was modified to better accommodate the jet airplanes that saw increased use in the 1950s. In the late '60s it became a civilian airfield and its name was shortened to Goodyear Airport and then changed to Memorial Airfield. In the late 1970s hangars were finally added and it took on the appearance it has today (minus the rust and decay, of course). By this time, the airport was mostly used by Biegert Aviation, a company that flew piston-engined aircraft that had been converted into air tankers. By the 1990s, the airport had become a boneyard for retired aircraft. Dozens of old airplanes sat in various states of decay and dismantlement. It must have been an awesome place to explore. In 2006 plan were drawn up for redeveloping the airport, which involved giving the structures a Native American style. and at least one of the runways was repaved. But the plans never came to fruition. Since then, most of the retired planes have been hauled off and scrapped. By 2007, the Gila River Indian Community was given control of the airfield and gave it its current name, Gila River Memorial Airport. 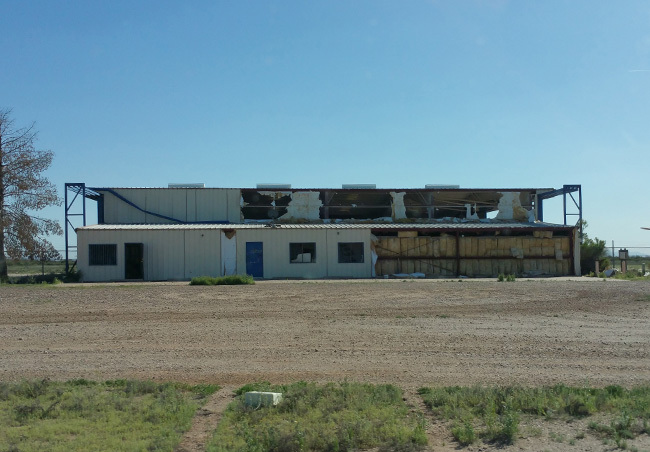 All commercial tenants were evicted and allegedly there was talk of building a casino on the site. Can you see the little plane buried beneath the rubble? 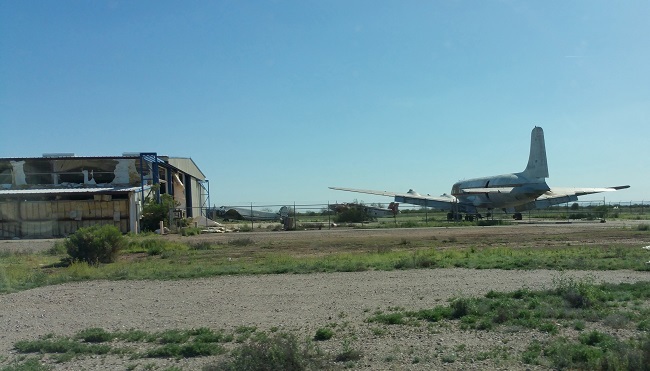 When I visited, only a few airplanes remained on the property and three buildings stood in fairly advanced states of decay. I didn't go inside any of the hangar buildings because there were large swarms of bees in each of them. I was only able to take a few pictures before a police officer showed up and asked me what I was doing there. I told him I just wanted to take pictures of the neat old planes. He informed me that I was on an Indian reservation and said "The Indians don’t want you here". He also told me that I could be cited for trespassing and have my vehicle confiscated for 30 days. I quickly got the hell out of there and continued on to explore the bizarre abandoned Casa Grande Domes. Ummm, so was the cop an Indian or just a bully? "They don't want you here"...rude. I couldn't tell if he was Native American or not, but I wasn't about to ask. He definitely didn't need to be so rude. Sorry to say but on February 26 around 6pm the airfield burned down. Sad to see such a cool place be destroyed. Thanks for the update! I'm glad I at least got to see some of it before that happened. Any information on this site as of recent? New to Phoenix area and hear a lot of this place wold really like to go get some photos of my own. I heard it has been demolished, but I haven't been able to verify it. I actually went to explore the airport a couple months ago, it still looks pretty much the same. The fire caused minor damaged to one hanger, but the metal structure is still intact. I was there for about an hour before the tribal police showed up and asked me to leave. I'm pretty sure they keep a close watch on the airport. Everyone I know has been escorted off the property by police. I'm glad the fire didn't do too much damage. It's nice that you got to spend an hour exploring before you had to leave. Awesome time walking through the planes, seeing the cockpits, and rummaging through the hanger. I need to go back and spend more time there. 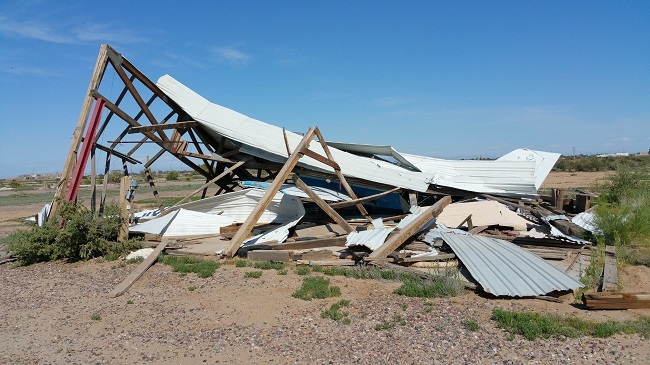 The officer probably explained that, because Memorial Airfield is on the Gila River Indian Reservation, permission is needed to enter the property and, if you do not have permission, it is a violation of the Gila River Indian Community's Civil Trespass Ordinance. You can be cited and fined. He didn't go into that much detail. Just went here today! The planes have much more graffiti on them now, but otherwise everything looks pretty much the same. Great adventure! 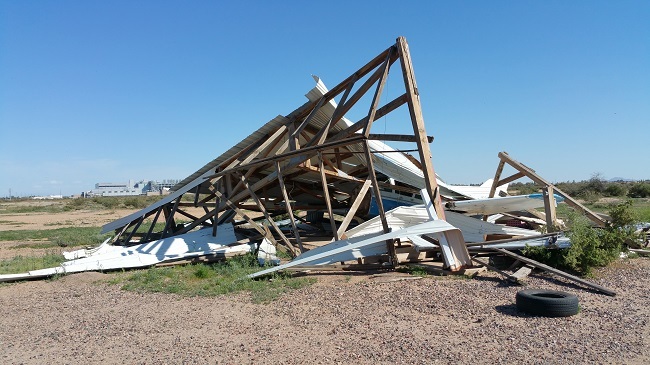 If you like abandoned airports, check out Echeverria west of Wickenburg. That place is a fun exploration. I'm glad you got to have a more thorough look around than I did. It's such a neat place. Thanks for suggesting Echeverria! I've added it to my list of places I need to visit. I love exploring abandoned airports, but haven't had the opportunity to visit many. Hopefully that will change soon! Thank you for the info. I spoke with a Chandler officer today. He gave me the number to the tribal police. I am going to try to get permission to get photos and video with my drone later this week. Awesome! Were you able to go out there and get any drone footage? If so, I'd love to see it. I would like to visit that awesome place, and take pictures of the planes ! Is it an open area, or I must have a permission to enter ? You need to get permission to enter. The Indian Tribes let everything go to pot unless it's a casino. The tribes are corrupt a tiny minority get rich 99% live dirt poor. It's a shame because so much potential for places like this to become something. Tribal police can't enforce their laws on non-tribal members they can confiscate your stuff you have to go to federal court to get it back most just forget about it. Tribal police can enforce state and federal law they will hold you for local sheriff. I have known a few who got their guns confiscated they had to go to court get them back.